NAIROBI, Kenya – I have traveled to Kenya three times in the past four years. Unexpectedly, each trip is better than the last. I say “unexpectedly” because there is always a fear of sophomore slump after a momentous excursion — even if that excursion is to a place with the geographical extremes and bittersweet history of Kenya. I am on the board of an organization called OneKid OneWorld, and it is with this fine group that I do most of my African travel. OKOW locates dilapidated schools in war-torn and impoverished countries and resuscitates them. It’s pretty simple really: Build a school, buy some books, get some desks, pay some teachers. Keep the infrastructure and management local and have a good point person on the ground to monitor the money and progress. Four years ago, standing in the blazing sun in the middle of the African desert, I looked a Samburu tribeswoman in the eye and promised her we would build a school for her children. A year and a half later, we had two brand new classrooms and a third on the way. We travel to the Kenyan schools every eighteen months to see our build-outs and identify new projects that might require assistance. It is arduous, it is far away, and it is the single greatest adventure I have ever been on. I am at the charming Fairview (“The Country Hotel in Town”) in Nairobi waiting for everyone to arrive. The plane won’t land for an hour, so it’ll be a gin and tonic and a good book to keep me occupied. As long as it doesn’t have anything to do with planes, I’m happy. I've had it with stale air, cramped legs, and flying in general. I thought about knocking off early, but the meds or anticipation won't let me sleep. Instead, I am sitting by the pool eating a pretty decent frozen pizza (extra crispy, generously doused with Tabasco), listening to neighboring tables chattering in polyglot dialects. There the requisite polite and unstylish British tourists and one mewing cat that wants my pizza. I give her some because, well, she's cute. The Fairview is pretty bare bones and the beds are like rocks, but it's set inside an enchanting walled-in garden of bougainvillea. There is a fountain, a pool, and about 25 smiling staff members willing to carry any number of suitcases or bring me a bottle of water. There are smoldering braziers by the tables (for mosquitoes, I suppose) and no canned music, no Marriott carpeting, no hermetically sealed rooms, and no dogs. There can't be, because kitty is still right here. More tomorrow after Kibera, supply shopping, and rigorous sunscreen application. Equatorial sun in March looks to be pretty fierce. Long day. Good day. Not over yet. Woke up early. Birds! So many! So loud! But they knock off after half an hour and I tossed around for a bit. Started my day in earnest just before 7 a.m. with hot Kenyan tea and TV news. CNN is very concerned about Japan. Al Jazeera is concerned, but more scientific. Less, "Mary, have you spoken to Ray since the last aftershock?" and more, "the total volume of water onshore is unknown at this point." Met the gang at breakfast. Everyone is in good spirits. We loaded ten people, Purell, water, and cameras into two vans and headed out to the textbook shop. After the ten-minute appointment that took an hour (Kenyan time is like Mexican time), we landed at the nursery we support in Kibera. Kibera is the largest slum in Africa, housing over 750,000 people in the most primitive living conditions imaginable. We support a day care center run by HIV-positive widows and mothers who are pooling every last resource to keep their center afloat. The women know that if the children get into a learning environment early, they will have a significantly higher chance of making a life outside the slum. We supply them with books and basic foodstuffs, and subsidize the rent. It is helpful. But it is never enough. The kids range from 2-7 years. They are heartbreakingly earnest and clever, though two of the babies cried every single time I went near them. We played games, sang songs, worked on shapes/colors/English letters, and took Polaroids of everyone. After a delightful and exhausting two hours (toddler moms, how do you do it?) we headed out. We did some food shopping, sat in traffic, and made a pit stop at Giraffe Manor, a 20th-century British estate-turned-hotel in the Ngong Hills. Giraffes and warthogs roam the property. You are welcome to feed the giraffes. In fact, I put a food pellet on my lips, and a long-necked beauty — named Masi — calmly licked it right off. I have the pictures to prove it. We desperately needed to change money today, but bureaus are closed on Saturday. Luckily, the local casino takes American dollars and does not charge a fee. Score! I am full from Indian dinner (Goan fish curry) and have taken an Ambien. Oh, I'm tired all right, but guess what? It's frog-mating season at the hotel pond and it’s crazy loud. * Visiting our original school, in Samburu, which has grown from 40 to 375 students. 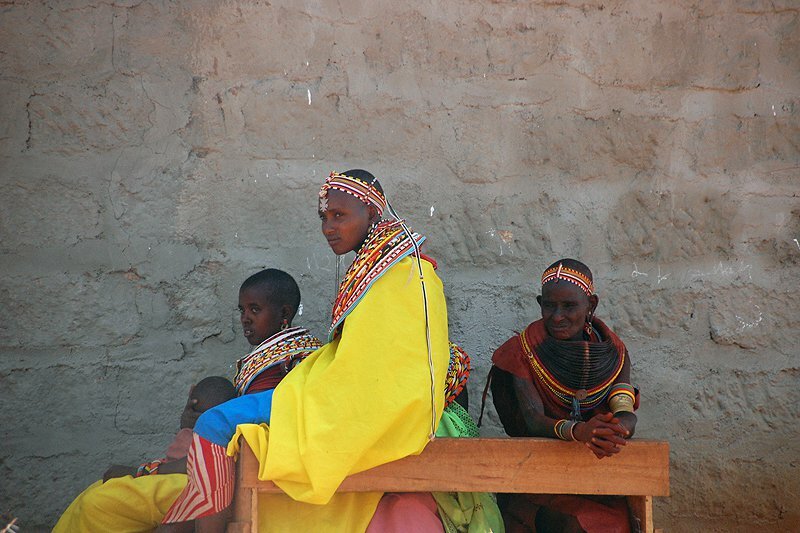 Some background: The Samburu people are closely related to the Masai in southern Kenya; both are pastoralists living in an exceedingly dry dessert. Say all you want about the science behind global warming: It rains less in Samburu than it used to, and the inhabitants know it. With families roaming farther and farther to find water, a proper education is virtually hopeless for the children of the community. The parents are desperate about this and want us to build a dorm so their kids can attend a proper school term. I bite my tongue to keep from making rash promises, because I want so badly to build this thing. More dorms mean more girls in school, and I am very eager to see that happen. * Learning Samburu words and using them in a game of Hokey Pokey with the students. * Getting a good view of the Great Rift Valley from the plane. * Enjoying refreshments at the Rusinga Island Lodge on Lake Victoria. It has a sweeping lawn and giant pier stretching into the lake. From its edge, you can see Uganda. This is best done with a Tusker in hand. * Chasing a bat out of my room tonight. Read Kenyan Diaries, Part 2 and Part 3. Stephanie, a Fathom contributing editor, is an actor, activist, and chronic wanderer. You can follow her at @marchstephanie on Twitter and Instagram. She travels for the sheer animal pleasure of seeing something new.